The first two T20 internationals between India and Australia to be played in Bangalore and Vizag are all set to get swapped. Due to the Aero India Show as well as the visit of Prime Minister Narendra Modi, the Bengaluru Police Commissioner conveyed that they wouldn’t be able to provide adequate security. 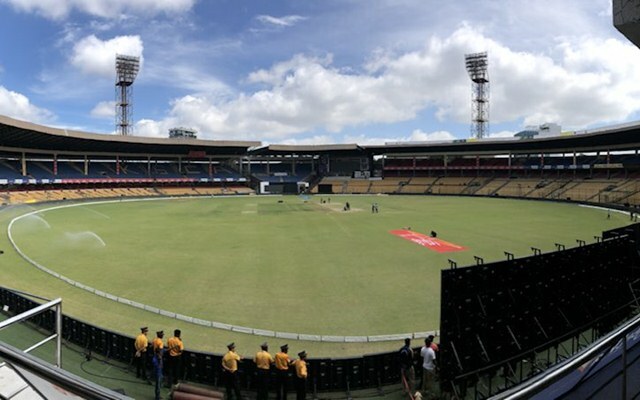 Keeping in mind the security arrangements, the Karnataka State Cricket Association (KSCA) has requested the Andhra Cricket Association (ACA) for a swap of the T20I matches to be conducted. Here is the mail that was forwarded by Sanjay M. Desai, president of KSCA, to ACA general secretary Arun Kumar. “As I mentioned to you there has been an adverse development that the Police Commissioner in Bangalore is unable to guarantee the required security support, police bandobast etc. In view of the above, we would request you to kindly consider swapping our T-20 match with yours i.e. you would host the First T-20 match on Sunday, 24th February, 2019 in Vizag and we would host the Second T-20 match on Wednesday, 27th February, 2019 in Bangalore. I would urge you to consider our request urgently and we would be grateful if you can kindly confirm this swapping of T-20 matches to us and more importantly to the Office Bearers,” as quoted by Hindustan Times. Amitabh Chaudhary who has been the acting secretary of the BCCI forwarded the mail to the CoA. The request was approved by Diana Edulji. Here’s the copy of the mail. This will be India’s last assignment before the World Cup in England. India are scheduled to play two T20Is followed by five One Day Internationals.